Palau'amine is a bisguanidine antobiotic first isolated from the marine sponge Stylotella agminata (western Caroline Islands part of Palau) in 1993 (Kinnel et al. DOI). Take 600 g of sponge, extract it with 6 liters of methanol, do multiple sessions of chromatography and you may end up with 14 mg of the compound. 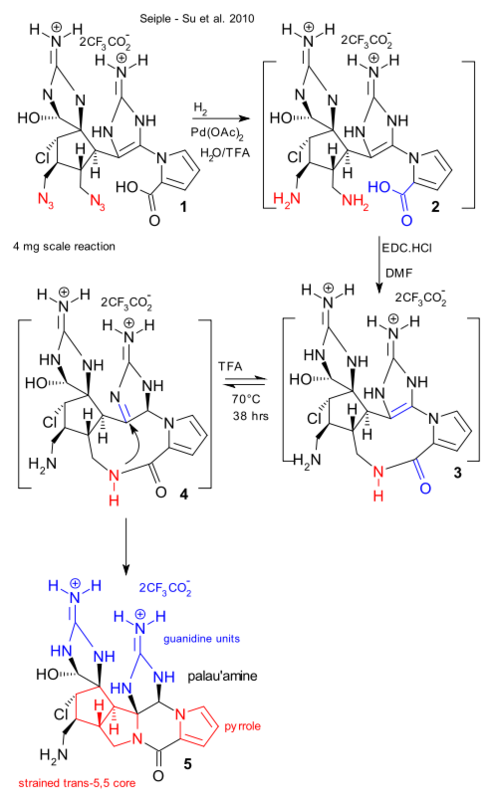 Palau'amine is characterized by a strained bicyclic 3.3.0 cyclooctane core, a large number of stereocenters, a sensitive pyrrole group and by two guanidine rings which in addition to the potential medicinal properties has made it a natural target for several total synthesis teams over the years. Synthetic palau'amine is now a reality thanks to Seiple and Su of the Baran group (DOI) and features several of Baran's hobby horses: biomimetic synthesis, cascade reactions and redox economy. The final step is notable. In it (4 mg(!) scale) the azide groups in 1 are reduced to amine groups (hydrogen, palladium acetate) in 2 and an amide group is formed in 3 using EDC. A prolonged reaction with trifluoroacetic acid forms amidine tautomer 4 which opens the door for a transannular amine-imine addition reaction to palau'amine 5. Overall yield 0.0015% from commercial precursors. As a note of interest the final ring closing step according to the publication was envisioned based on an old-fashioned hand-held molecular model.